Contemporary ARC-O-LITE Skylights are a model of efficiency. Thes "windows in the roof" are designed to shut out inclement weather, are shaped to clean themselves in rain, can be insulated (double domes), will provide ventilation, access to the roof and even help fight fires. 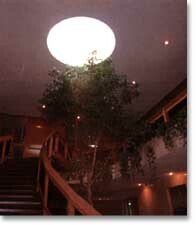 Sometimes a skylight is the only way to bring natural daylight into a building. On a square foot basis, skylights admit far more light and distribute light much more evenly than a vertical window simply because they face directly toward the sky. In commercial and industrial areas, walls may be kept open for storage, resulting in less chance of break-ins or vandalism. Skylights may also be used to advantage in building entrances to enhance foyers or spotlight attractive features such as sculptures, murals, paintings, planters, reflecting pools, etc. A whole room roofed over with skylighting can add greatly to the atmosphere of a garden court or restaurant. The use of cheerful, attractive daylighting with dome skylights is leading to new design concepts in residential construction. The natural appeal of bringing the outdoor scene indoors provides a unique sales attraction for home builders. Residents of many existing homes have found that skylights can turn a dark bathroom into a bright one without loss of privacy, make a garage corner or laundry into a cheerfully efficient workspace or inexpensively open up an attic for add-a-room remodeling.